One of the secrets to California-style Italian cooking: We sneak more vegetables into every meal because they’re not only nutritious, they’re delicious when prepared with Garlic Gold®! 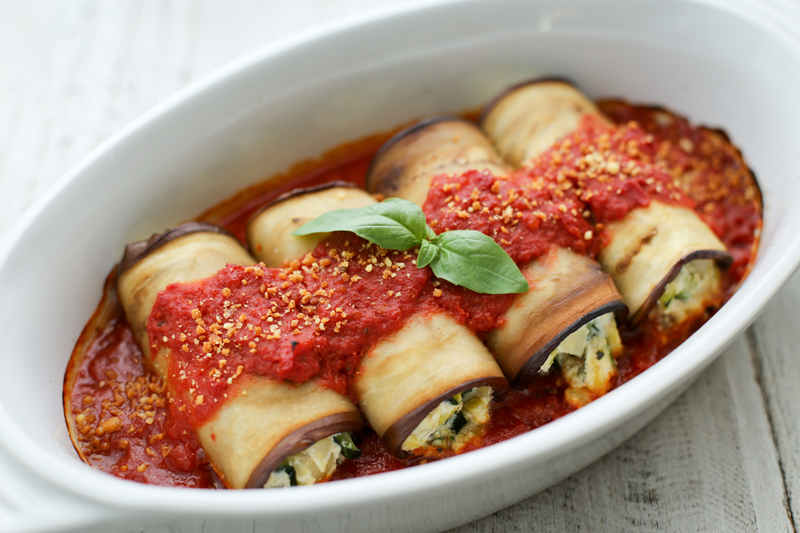 These eggplant roll-ups are like stuffed shells, but better (and better for you and your family, too). Many eggplant recipes require you to fry the slices in oil, which makes them very high in calories. We skip this step by salting the eggplant instead. After they’re rinsed and patted dry, the slices of eggplant are pliable and easy to work with. 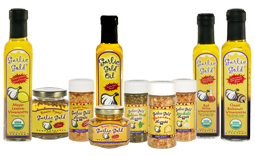 We brush them with a little Garlic Gold® Oil for flavor, of course — just a couple tablespoons does the trick! The eggplant gets rolled up with a filling of sautéed zucchini, onions, and ricotta cheese, along with our Garlic Gold® Parmesan Nuggets. Next, just pour a little marinara sauce over the top and bake them up. The eggplant becomes tender and delicious, and you’ve got a main dish and vegetable all in one! Prepare the eggplant. Salt the eggplant slices and arrange them in a colander. Let sit for 1 hour. Rinse, then pat dry between paper towels, pressing down on the eggplant to draw out excess water. While the eggplant is sitting, prepare the filling. In a large skillet, heat two tablespoons of the Garlic Gold® Oil over medium heat. Add the zucchini, onion, and salt. Sauté until softened but not browned, about 10 minutes. Transfer to a large mixing bowl and let cool. When the sautéed vegetables have cooled to room temperature (about 30 minutes), add the ricotta, Parmesan Nuggets, and oregano. Stir to combine. Preheat the oven to 375ºF, then prepare the roll-ups. Pour half of the marinara sauce into the bottom of a 9 by 13-inch baking dish. Use the remaining Garlic Gold® Oil to brush each slice of eggplant. Scoop 1/3 cup of filling onto the bottom third of each slice of eggplant, then roll it up. Set the rolls seam side down in the baking dish of marinara. Spoon the rest of the marinara sauce over the rolls. Bake for 40 minutes, or until eggplant is tender and sauce is bubbly. To slice the eggplant thinly, the best tool is a mandolin slicer. Make sure to use a cut-proof glove for extra safety! If you don’t have a mandoline slicer, just use a large chef’s knife and get the slices as even as possible. Vegan variation: Substitute a package of firm tofu, crumbled, along with 1/4 cup nutritional yeast instead of ricotta cheese, and use Italian Nuggets instead of Parmesan Nuggets.